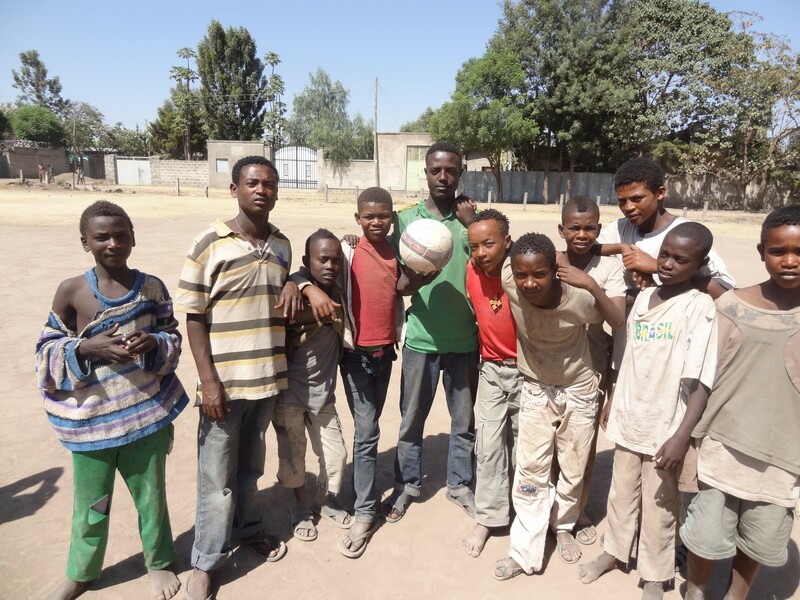 These are the 11 street boys that form the Anbesa Club started by an American woman, Christina, who describes her calling this way. “He said “go”… with no church family behind me, no husband to lead me, and no money to provide for me… even with no clear plan of why I was going. The passport for my son miraculously was granted, the money for plane tickets miraculously showed up. “Be my witness, I will send them to you” was the only plan/mission I was given. Jesus had to be my focus, after all it is He who is the way the truth and life, nothing else.” So she worked with the street boys daily for 5 months before the enemy attacked the mission and she had to return to the states because of serious health problems. She had heard of what the Lord was doing in our lives and mailed us a plea to help along with a description of the boys to our PO Box in Hawassa. She requested us to pray whether we might help these boys continue in the plan and purpose she had to spiritually and materially raise them out of the desperate poverty in which they were living. Upon receiving the information we found the boys at the Manharia bus station and later brought a university friend to evaluate the possibility of resurrecting the plan the Lord had given her. We need to hire a case manager to monitor the small profits they make from their street jobs so they can pay for a room in which to cook their food and safely sleep. Then they needed football jerseys on which would be printed the name Club Anbesa and a ball in order to maintain the only semblance of belonging to a family since being displaced from their own families because of poverty and other extraordinary circumstances. Pray that we may receive favor from local government officials to legally help these kids to work, stay in night school and grow in the grace of the Lord to arise above the dangers of street life and the crippling affects of poverty on their destinies in the Lord. Although caseload management of street children may be a common idea in most western nations, the vision and mission given to Christina has not even appeared on the horizon in Ethiopia. Legal help is only seen as housing children in expensive and strictly regulated NGO facilities. Pray for wisdom and favor!! !